Explain the role of motivation in enhancing a sports performance "... the internal state which tends to direct a person's behaviour towards a goal." (Kent, 1994) "...motivation has been seen as having two aspects: it is what drives id to do things ...and it makes us do particular things." 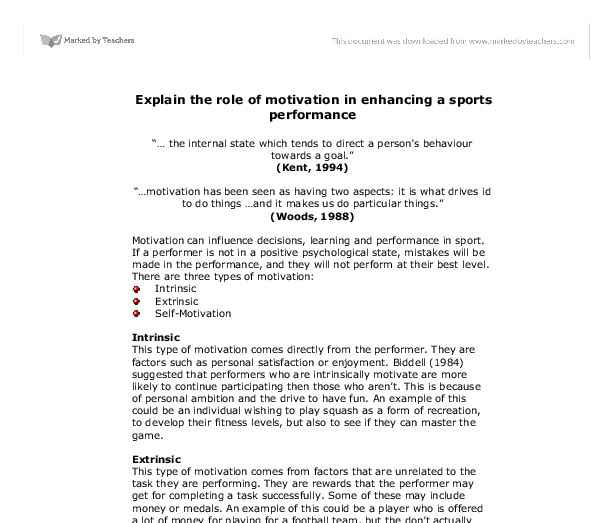 (Woods, 1988) Motivation can influence decisions, learning and performance in sport. If a performer is not in a positive psychological state, mistakes will be made in the performance, and they will not perform at their best level. There are three types of motivation: Intrinsic Extrinsic Self-Motivation Intrinsic This type of motivation comes directly from the performer. They are factors such as personal satisfaction or enjoyment. Biddell (1984) suggested that performers who are intrinsically motivate are more likely to continue participating then those who aren't. This is because of personal ambition and the drive to have fun. An example of this could be an individual wishing to play squash as a form of recreation, to develop their fitness levels, but also to see if they can master the game. ...read more. Motivation can have major effects on how an individual carries out a certain task and how much effort is put in to it. Motivational basis of achievement can be quite varied, as there are some individuals that although are highly motivated may not be very successful. In this case encouragement must be given so that the drive to succeed is not lost. Participants who are motivated, are more likely to want to do their best, not only in the competitions, but also in the training. More factors which can effect a players motivation are: Arousal Achievement motivation Attribution Theory Arousal This is the energised state of readiness of an individual to perform a task, motivating them to direct their behaviour in a particular manner. It can affect the performer positively or negatively, both physiologically and psychologically, depending on the individual's perception of the situation, but can be controlled to produce an effective performance. The level of arousal is controlled by the reticular activating system, which interprets the level of stimulation entering the body and initiates an appropriate response. ...read more. Some extrinsic rewards represent a high level of ability, and so can increase intrinsic motivation. Motivators are the reasons why participants think and behave as they do. Motivation has five components: Direction, intensity, persistence, continuity and performance. Early theories focused on the notion of 'drive' current theories are based on social perception and goal orientated. To improve motivation the individual must be encouraged, the importance of the sport must be made clear and the benefits of the success that will win. Families must also play an important part as they prove to be the most influential parties. Coaches must also be seen to be motivational for the participants. Motivation and motivation levels are unique to every individual. Clubs must nurture the motivation of its athletes in order to help to maintain its participants motivational levels. In conclusion, I think that motivation does help in enhancing a sports performance, no matter what sport. However, the most important motivation is self-motivation, and not extrinsic motivation. This can be shown through people's love for the sport and the fact that although they like to win, it is the participation that counts. Word Count: 1,119 ?? ?? ?? ?? Rebekah Herbert ...read more. Extrinsic motivation - this means engaging in a behaviour because it is a means to an end and not because the activity is inherently pleasurable in any way. This may be to avoid consequences or to gain positive consequences. For example: A girl wanted to join a netball team. Reinforcement is important because if an individual's behavior is reinforced or rewarded in some way, it is likely that the behavior will be repeated. 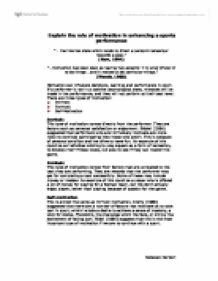 Situational Approach theory - Situational approach theory attempts to provide a perspective on organizations and management based on the integration of prior theories. The three body composition is ectomorph, endomorph and mesomorph. The reason why a cyclist is an ectomorph is because they will need no muscle and to be light on the bike and to be aerodynamic. If a cyclist is concerned about their weight, generally for performance and health reasons. However I still feel I need to develop my upper body strength. I found the evaluation of each session useful and will continue to do this in the future, not only for training but matches to make my goal setting more effective. Some people find it useful to assign a "worry period" during the evening or late afternoon to deal with these issues.